Editor’s note: If you participated in a My Miami Story conversation, the next step is to take the survey, which helps us record thoughts and ideas that came out of your discussions. Matthew Beatty, senior director of communications, explains why the survey matters. On October 23rd, more than 4,000 Miamians gathered at My Miami Story conversations to talk about our city’s future and, more importantly, what we can all do to make Greater Miami better. It was another incredible day of community reflection with residents deciding to take action around issues they care about, whether it’s making transit more accessible for residents, creating safer, more affordable neighborhoods or making sure kids are reading at an early age. Because we don’t want the conversations to end there, we ask guests to help record thoughts, solutions and actions by completing a short survey. With support from Knight Foundation, we’ve partnered with Hart Research Associates to create the survey and analyze the results. 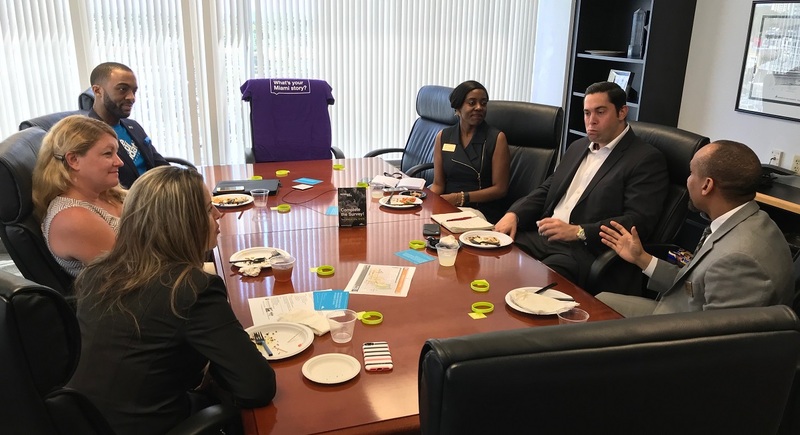 Now in its third year, My Miami Story conversations generate meaningful exchanges between residents about what life is like in Miami-Dade and ways they might change it. About every two years, we put out the Our Miami Report, a quantitative study on our quality of life. But, we know that for every data point there are dozens of stories behind how each person experiences it. My Miami Story is an opportunity to uncover those hidden narratives. The survey helps capture the real stories of people behind the data. The intent is to create a snapshot report that we’ll share broadly with stakeholders. Life in a community should be dictated by the people who live there. My Miami Story conversations are about making sure residents’ voices are heard by those making important decisions that affect all of us. Completing the survey adds your voice. What questions will the survey ask? The majority of the questions seek to capture your ideas and your solutions that came out of your conversation. You’ll see a few prompts that seek to better understand what motivates you to personally get engaged in your community (or what keeps you from doing so) and ways you’d want to get involved. We also ask about your experience and what you talked about. These questions focus on the topics of conversation, what points felt impactful, how optimistic participants are regarding the future of the city and what areas they believe need the most improvement. It’s also a chance to tell us what specific nonprofits, companies or organizations you think are having a positive impact on your community that we should have on our radar. The report, based on the survey results, paints a picture of how Miamians experience life here and their thoughts for improving it. We’ll share the findings with local leaders, elected officials, policymakers and everyone in between whose job it is to find out what Miamians think about their community, what’s working and what they would like to see change. It’s easy. You can take the survey right here. If you signed up as a guest on MyMiamiStory.org, you’ll get can email to the survey. If you shared your email with your conversation host, they’ll make sure we get it. Or simply text “MMS2018” to “797979” and complete the survey on your smartphone. Our research partners will compile the results and help local civic leaders and changemakers better understand how Miamians experience their community. Matthew Beatty is senior director of communications at The Miami Foundation. I signed up at Aventura Library. The time was changed and the participants weren’t notified. I would not have cancelled another commitment had I known. Although the facilitator was a lovely person from the library, she was not equipped to handle the group. As a result, 2-3 people dominated the conversation. There were many good ideas, but several were focused on their own needs to talk about their personal issues. There were several who want to meet on a monthly basis, more to make new friends that getting to know the community.